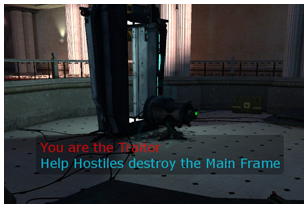 If you get selected as the Traitor, you will see the message "You are the Traitor", the Main Frame / Advisor Pod icons will turn from "Protect" to "Destroy" and your objectives will change into the Traitor ones. You will also be able to see the glow outlines of the other metrocops, which helps you a lot in trying avoid getting caught. Your purpose is not to directly attack other players, but rather to sabotage and cause mistrust among the other players. As an Unrevealed Traitor you will get Alyx's Emp Tool, which can be used to hack a lot different things, causing trouble for the Combine forces. As only the Traitor can use the Emp Tool, he should be careful not having it selected while other players can see him. Hacking Combine interfaces with the Emp Tool gives the Traitor a bunch of advantages. First, the other metrocops can no longer use the Interface unless they get a Stalker to fix it. All the Combine Shields and Combine Turrets connected to that Interface also get hacked. Hacked Combine Shields only let Traitors through, while hacked Combine Turrets also attack the Unrevealed Traitor. This is to prevent player's from getting caught by the fact that they are not being shot by the Turrets. The Traitor can also hack Combine Door Locks to Unlock or Lock them, as well as Manhacks and Combine Floor Turrets. Everything else, such as Combine (Ground and Ceiling) Turrets, Combine Shields, and Generators, are hacked by hacking the Combine Interfaces. When the Traitor is still Unrevealed, the Hostiles do not know he's working for them, and thus they attack him like any other with a Civil Protection uniform. If he wants to stop them from attacking him, he has to Reveal himself. This is done by pressing the Reveal key (Default: j, can be changed from Keyboard Options) which brings up "are you sure" pop up. Once the Traitor has Revealed himself the Hostiles will instantly stop attacking him, but the next time he dies he will no longer get the Emp Tool. He will also not be able to see the glows of other players anymore, and for a little while, all the other players can see his. In most maps revealing yourself also triggers a Combine Death Squad, which is a group of four Combine Elite Soldiers coming after the Revealed Traitor. However, the Revealed Traitor can now do damage on both the Main Frame and the Advisor Pods. In Antlion maps like tr_leech he also gets the Bug Bait, which he can not only use to spawn Antlions, but they also wont anymore attack him. There's a lot of cons in Revealing yourself, but it can be useful in some situations: if you are getting attacked too many times by the hostiles, Dog, Alyx, or the Main Frame doesn't have much health left anymore. The idea behind the Traitor is that he's supposed to take a bit more of a sneaky, stealthy approach, instead of trying to destroy the Main Frame directly. If the Traitor Reveals himsel too early, and the other players then get the generators back online, and all the Combine interfaces fixed, he usually can't anymore reach the Main Frame. He has to help the Hostiles do the most of the work, by letting them through the Combine shields, causing enough chaos among the metrocops for them to loose control, and then only when the Main Frame health is low enough, he should Reveal himself. Don't always hack interfaces. This creates an alarm and adds an objective to the other player's hud. Try disabling combine shields instead. This is a lot less easy to notice and wont get instant attention from the other players. When you hack, make sure you are not seen, and make sure the other player's are not in the same room. If they all know for sure where each other they are, while they don't know where you are, and something gets hacked, they will know it was you. Use grenades to assassinate players. If you tried to shoot someone while being Unrevealed, they can easily turn and see who it was. But with grenades you can easily throw them into a room or down a hole without them being able to know who it was. Pretend to be shooting. While you might not want to hurt your Hostile friends, it might create suspicion if you just ran past them when other metrocops see you. Thus you can try pretend to be shooting at the Hostiles, while in reality you deliberately miss.